College students go home on the weekends normally to destinations that include a couple hours of travel time. Gas is expensive, and they have a couple seats open that could go to good use. This problem is also faced by businesspeople who travel town to town, and the regular old road trippers. The Split Trip App was invented to fill up all the seats in a car when going on longer trips to increase efficiency. The driver can turn a profit, and the tripper gets cheaper fair than traveling with the City-to-City bus systems. Split Trip believes something interesting happens on between point A and point B. Every rest stop is a new friend, a delicious meal, or a chance to breathe in the local air. All the while, there is someone experiencing this with you. This makes car travel cheaper and more meaningful for our trippers. Split trip gathers inspiration from the beauty of the open road along with the quirky and fun signs to see along the way. Fun arrows normally pointing to mid-century hotels will direct the user to each menu item. The user even receives their own road sign when looking at their profile picture With sunset gradients, and clean, easy to use functionality of the interface, users are sure to know that setting up their trip is simple. 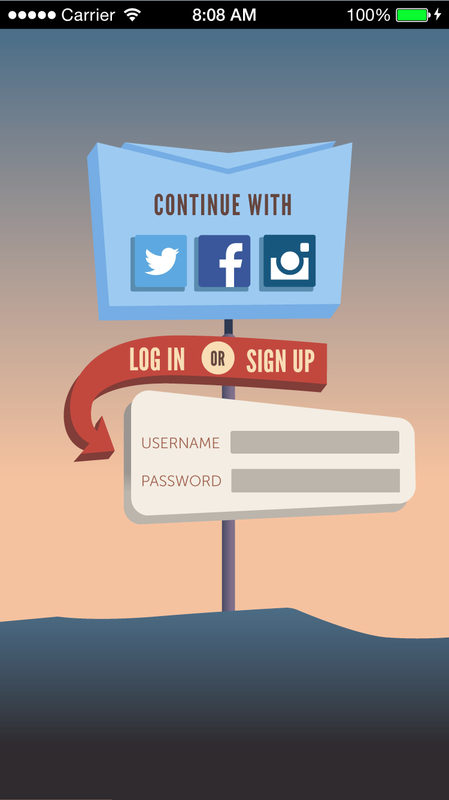 Once the user goes through the loading screen, logs in, or signs up, they are taken to the "Find Trips" page. From here they can find trips near them with a quick search. From here, a user can create a trip as a driver. Step 1: This is where the user can enter in their start and end location of the trip, add the option of making the trip round trip, and allow the tripper to add pit stops or not. Step 2: The user can add the day of their departure and add pit stops to both trips if the user is going round trip. Step 3: The user can add how far they would travel off their route to pick up a tripper. They can add seats, the price of the seat, what kind of seat, and the number of bags a tripper can have. Once the user uploads the trip, it will go to the trip page as if they were viewing it as a tripper. Here, the Tripper can look at the trip they are on. 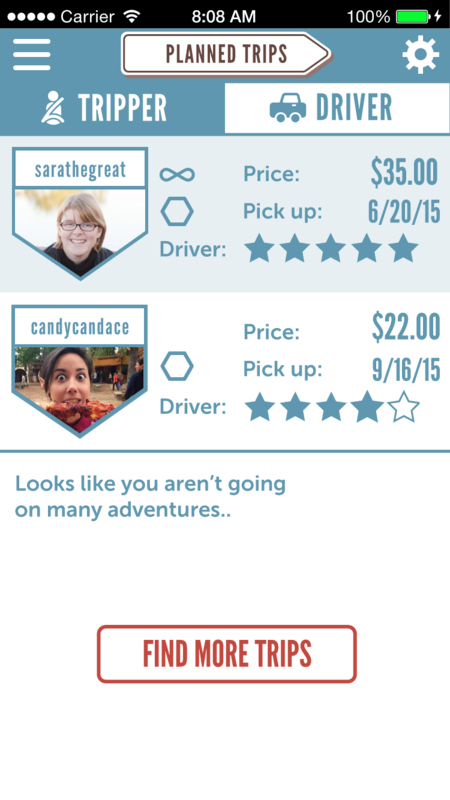 Games such as twenty questions or road trip bingo will show up until they arrive at their destination. 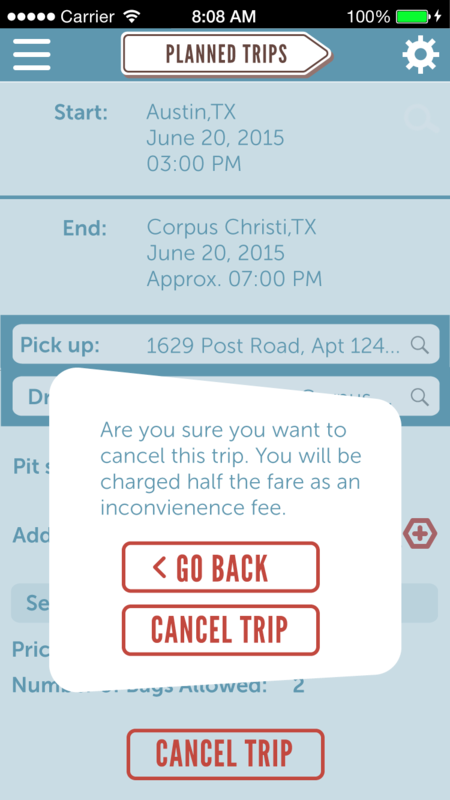 A "Pay Now" button will appear, and then they can pay for the trip with one touch. If the driver looks at current trip, it will just remind the driver to pay more attention to the road (it is fun for apps to be snarky). If you have a good internet connection, you might want to explore the app in invision. From the find trips section of the App, the user will be able to find trips based on their location of pick up and the day they want to leave. They can also find trips that are more specific to their needs by choosing advanced options. As a Driver, the user can manage the people going on their trip. They can approve trippers who have requested to trip with the user. Here, the user can go through the trips that are coming up. They can also cancel a trip, but not without paying half the full price of the fare.